President Obama has recently caused Republicans to scream and throw a tantrum regarding his State of the Union address calling for action and the use of executive orders to find solutions around Congress's inaction, more specifically his latest promise to issue an executive order increasing the minimum wage for federal contractors from $7.25 per hour to just over $10 ($10.10 to be exact). Why does the hysteria from conservatives not matter at all? 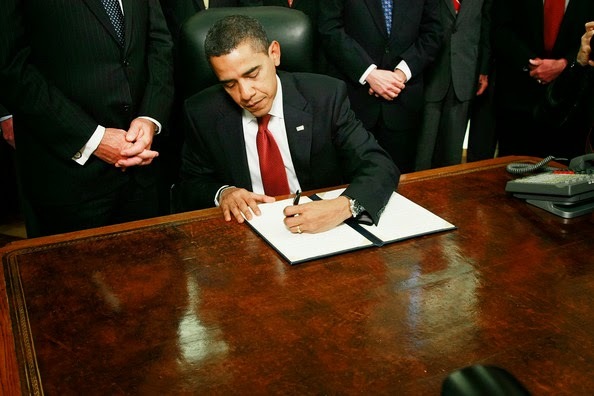 Ignoring the fact that Obama has issued much, much less executive orders than his last few Republican counterparts, a simple comparison can be made between an executive order made by his predecessor George W. Bush over a decade ago (and more than once) and Obama's December 23rd, 2013 executive order issuing a 1 percent raise to federal workers. Executive Order 13282, titled "Adjustments of Certain Rates of Pay," was issued December 31st, 2002. It dealt with federal pay. Executive Order 13655, titled "Adjustments of Certain Rates of Pay," was issued December 23rd, 2013. It too dealt with federal pay. The only difference was that when George W. Bush used his executive power to increase the rate of pay for federal workers Republicans did not weep for the death of the Constitution.